We want to change the way the UN works. No such effort can be achieved single-handedly. Together we can stop illegitimate vetoes. You can do it in three ways. As an individual, take a stance against illegitimate vetoes by registering as a supporter. Become a part of our Swedish group based in Uppsala; or get our help in starting your own local group anywhere in the world. Talk to friends and family about the veto, and why it is important that the permanent five members of the UN Security Council change their ways. Join in the discussion, share our posts, and like our page on Facebook! Show your support, become a supporter! We are fully dedicated to stopping illegitimate vetoes. We are sure you want to be too! Add your name to our list of supporters and strengthen the movement to achieve a more efficient United Nations. Not sure why? Listen to some of the reasons why a change of the veto is needed. In certain situations we can have the vast majority of the General Assembly adopt a non-binding resolution, and then 14 of the 15 Security Council members vote in support of that resolution, but this can all be hijacked by one permanent member vetoing a resolution. I mean, this is a historic anachronism and illustrates a necessity for wider UN Security Council reform. The permanent five members, they use the veto in situations where it’s actually not legitimate. And this is why I think that it is so important that member states but also non-governmental organizations and students around the world analyse this question and send a very, very firm message to the Security Council that they have to do better. The Challenge Group and its project which I strongly believe are key features on to maintain international peace and security, making it vital to spread awareness about the consequences of the use of the veto by the permanent members of the UN Security Council. By signing as a supporter of the campaign, you can show the United Nations that change is needed. Click here to become one of hundreds of supporters worldwide. There is much to be said about the status of the veto. Surely you have an opinion yourself. Use our platforms to discover our opinions, and share your own thoughts! Become a part of our Swedish group based in Uppsala – or get our help in starting your own local group anywhere in the world! 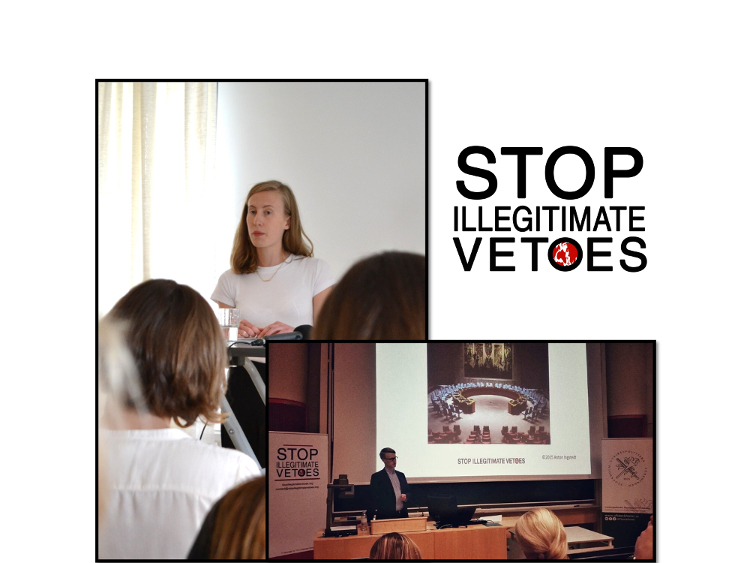 Every week, we meet, in Uppsala, to discuss and take actions against illegitimate vetoes. You are welcome to join us! If you are located elsewhere in the world, we would gladly assist you in your actions against illegitimate vetoes. The Stop Illegitimate Vetoes campaign is run by a politically and religiously independent, non-profit organization. Therefore, we are funded by our great supporters! You may donate to our cause through PayPal. Any sum is appreciated.